"I have had an amazing week, improved my wire wrapping, made great friends, eaten amazing food and stayed in fabulous accomodation - what more could you ask for?" "If you want to push yourself to produce more complex wire work pieces this is for you. We have all had an amazing week, learnt loads and achieved much more than probably any of us thought we could." 16 places, prices viewable click here and booking forms released and bookings taken on Friday 13th. 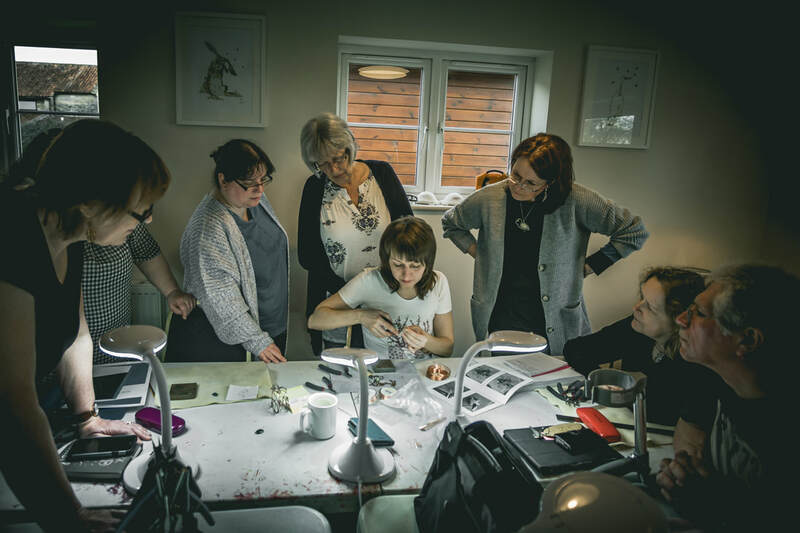 The UK Wire Wrapping Retreat is a fun but intense week in the Somerset countryside, learning from top international wire jewellery designers helping you develop your skills and learn in a relaxed creative environment. We aim to create an environment that garners creativity and confidence, enables you to step away from your everyday life to focus on the important job of making with your hands. "Fantastic event with 2 very inspirational tutors James Jimjam Ferris & Ivona Posavi Pšak. Learnt so much. Accommodation fab & food brilliant. Already saving up 4 next year - an event not 2 b missed if u r serious abt wire wrapping." 5 days teaching with some of the worlds most talented wire designers. Unique projects designed especially for the retreat. Access to a creative space from 10am - 11pm. Workshop tools such as dremel rotary drills, polishing equipment. Full soldering equipment for both copper and silver. Set at the foot of the Glastonbury Tor and with far reaching views over the Somerset countryside its the perfect place to retreat to and focus on wire. A room or a cottage to yourself or to share with a partner or friend in a historic venue with tea and coffee making facilities, all bedding and towels provided. 2 separate 2 day workshops, 1 with each tutor. Plus .5 day independent working and .5 day to polish and protect. Take home everything you create. Individual and named tools bags to use for the duration of the retreat with full set of professional quality pliers, flush and heavy duty cutters, 3 sizes of bail pliers, nylon jaw pliers, tweezers, nylon hammer, chasing hammer, metal ruler, bead mat, masking tape, pen, pencil, scissors, sharpie and a note book. All materials needed for the workshop e.g. copper wire, solder paste, silver wire, beads, cabochons, semi precious. Printed tutorials in full colour or digital on request. Unprecedented contact time and support on your wire journey with the tutors and on hand support from the founders. 3 delicious homemade meals prepared and cooked on site by our fabulous chef Keren of Events Horizon. Breakfast: Porridge, granola, diary and free yogurt, fruit, eggs, bacon, mushrooms, baps. Full English on the last morning. Lunch: buffet style with quiches, open sandwiches, pies, salads, grains, olives, pickles, peppers, stuffed rolls, tortillas and pastries. Dinner: lasagne, shepherds pie, chilli beef, stuffed peppers and mushrooms, pork in cider, roast beef and veg, veggie pies and to finish the week off homemade curries. All dietary requirements are catered for including vegan, dairy free and gluten free - our chef is very good at this and makes a range of options throughout the week so no-one is left out.